Eric Enstrom, (28 December, 1875 - November, 1968), was an American photographer born and raised in Bovey, Minnesota. He is famed for his photograph, showing Charles Wilden saying a prayer while his simple meal is resting on a table in front of him. Charles Wilden had given him a visit at his studio in 1918. What Eric saw in Wilden was what made the idea strike. Wilden had put up a kind face even though his appearance showed someone of lowly means. Eric then decided to arrange the set with the Bible, Spectacles, bread and a bowl of gruel and asked Wilden to sit and hold his brow with both hands as if saying a prayer. Wilden’s looks and pose made the whole thing look natural. Eric was thus able to take the picture and clearly express the desired message without much ado. Although the image didn’t capture many people’s attention that year, it became the center of attraction a few years later. 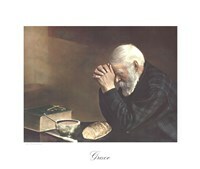 The photograph has become widely known as “Grace” and has been reproduced in paintings and in different colors. Eric took the image in an effort to show that although people may lack some things, it's important to be thankful for the little they have. The image was basically developed in black and white, but was later painted in color by Eric's daughter. “Grace” is nowadays found on different walls including churches, homes, amongst other places. Eric’s love for photography didn’t just begin with “Grace;” he was already taking pictures and continued to do so even after the famous “Grace” became widely celebrated. As he was getting older, he spared more time to spend with his family. In the 1940s, Eric purchased a property on Bass Lake and divided it into smaller pieces for his children. He also left a piece for himself and his wife, Esther. During this time, he spent some of his time outdoors taking pictures, fishing, and carrying out other activities.